Matthew 14:22-33 After Jesus has fed thousands of hungry people with five loaves and two fish, he sends the people home. It’s late, but he wants to pray, so he tells the disciples to take the boat back across the lake. He’ll meet them later. Now, if someone says, “You go ahead in the boat, I’ll meet you later,” you think, okay, he’s going to go on foot around the lake, or maybe take another boat across. You don’t think he’ll walk to you on water. So when the disciples see someone walking on the water, when they all stand up in the boat and lean way out to get a good look, they’re not thinking, “Oh, that’s Jesus.” They’re thinking, ”Oh, Jesus, that’s a ghost.” And so you can also imagine how relieved they are when that familiar voice calls out and says something they’ve heard before: “Don’t be afraid. It’s me.” I imagine they are so relieved they sit right back down in the boat. They sit right back down and they grin at each other with those goofy grins you can’t help grinning when things that should have turned out really really bad turn out really really good. Jesus said he’d meet them. They assumed he meant on dry land. But it’s out here, in the wind and waves, in the wee hours, just when they’re most exhausted and aren’t making any headway at all. “Don’t be afraid. It’s me,” he says. And at that, everybody sits down and waits for him to get there and climb in. Everybody, that is, but Peter. We know what he does. He challenges Jesus, and Jesus challenges him back. 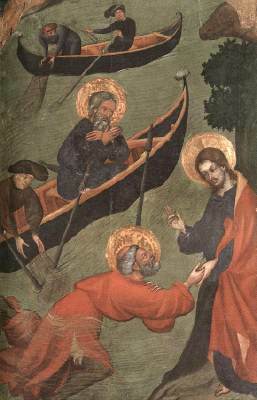 We know that he sinks, and that he cries out, “Lord, save me!” We know that Jesus grabs him in the nick of time, and that Jesus asks him, “Why did you doubt?” Now, when we hear that bit about doubting, we think Jesus is scolding Peter for noticing the waves and the wind. And it’s true. He notices, he wavers, he sinks. But it’s doubt that gets him onto the water in the first place. His doubt begins before he even leaves the boat. All the other disciples take Jesus as his word. It’s him. There’s nothing to fear. That’s why they sit back down. They believe it’s him. He’s coming. That’s all they need to know. But Peter says, “If it is you…” If you are who you say you are. You’ll have to prove it to me. Do a trick, a miracle, something cool and spectacular. Like, tell me to walk to you on the water. Where have we heard this before? “If you are the Son of God, turn these stones into bread, or better yet, jump off the temple pinnacle and see if the angels will catch you.” That’s Satan tempting Jesus in the wilderness. “If you are the Son of God, let’s see you come down off that cross and save yourself.” That’s the mockers tempting Jesus as he was dying. “If it’s really you, show me the nail marks your hands.” That’s Thomas tempting Jesus after the resurrection. The minute Peter says, “If it’s you, command that I walk to you on water,” he joins the company of the tempters, and that’s not good. Jesus calls him “little faith” not so much because he gets scared and starts to sink, but because he didn’t sit down when the others did, he couldn’t wait like they waited, he wouldn’t stay in the boat. Now, I know we often hear this story differently. We make fun of Peter for sinking, but we admire his courage and impetuosity. We think it took guts and faith to get out of the boat. We like people who strike out on their own and take risks. If you’re going to do something bold for God, you can’t just sit there. You have to do something. Faith climbs over the side, faith walks out to Jesus. Yes, you’ll have doubts. Yes sometimes you’ll go under. That’s okay. Jesus will give you a hand. So get out of the boat. Just do it. That’s the way we often read this story. Like a Nike ad. But the early Christians who handed this story down to us saw it differently. For them, the best thing you can do is trust Jesus’ promise that he is either already always with us or that he is always on his way to us. Trust that it’s him when he says so. Trust him enough not to tempt him, not to try to be him, not to walk on water, but to leave that to him and stay in the boat. Why in the boat? Because he’s getting in it, and you want to be with him. And because that’s where your sisters and brothers are, and you want to be with them too. Because life is treacherous and hard and it’s easy to get picked off by its cares if you go it alone. Because evil is real and you’re easy prey if you think you can confront it alone or depend on your own virtue to avoid it. Because human sin and woundedness require compassion and healing and forgiveness, but we are unlikely to grant ourselves such gifts, such is the depth of our confusion and shame. Because we do not save ourselves and we cannot be saved alone. If there is any safety to be had in this life, it does not come through self-sufficiency, but by discovering the companionship of God, and by sailing through thick and thin with other companion disciples. If we find healing in this life, it won’t be because we went it alone, but because by God’s grace we found good company, and by that same grace we bound ourselves to Christ and to others in affection and accountability. 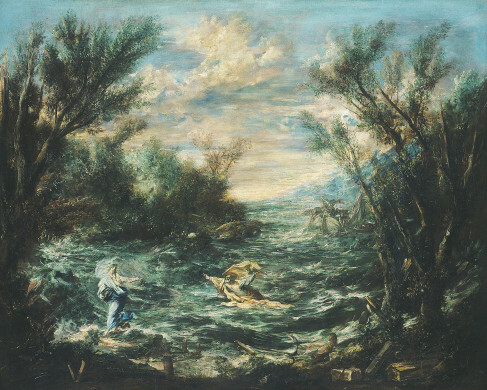 If there is hope for us, it lies in telling each other stories and singing each other songs, and eating from each others’ hands, and showing each other our dreams and visions, and reminding each other where we’d be if there were no boat, no companions, and no fearless Christ with us, but only rising water, only howling wind. If we live to see the dawn it will be because through every adversity we have sailed together. Today our story tells us to take Jesus at his word. To wait for him to arrive. To watch how he comes to us no matter how high the waves. He’s on his way, here even now, with us till the end of the age. Our story says, don’t be afraid, just sit tight, glad of the good company that gives meaning and hope to life’s sailing. Be a steadfast companion. Stay in the boat. Credit: Deacon Matthew Garrett of http://www.holy-icons.com for the icon image of the Mystical Church, above. This entry was posted in Sermons on September 24, 2012 by sicutlocutusest. Please credit the iconographer: Deacon Matthew Garrett of http://www.holy-icons.com for the icon image of the Mystical Church that you are displaying. Thank you.